The restaurant, also located in West Yorkshire, has received numerous awards over the years and it’s clear why. 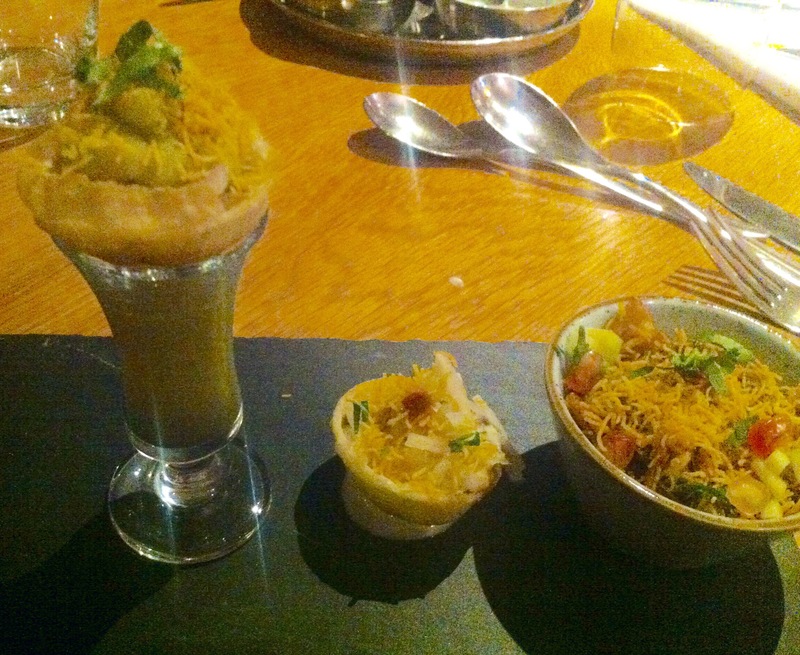 It was a unique Indian dining experience in an informal and relaxed setting. We opted for the 5 course Tasting menu as we wanted to try as many different dishes as possible. I was also intrigued by the menu description of a ‘taking you on a personal journey through India’ with each course being from specific regions. Before the first course arrived we were treated with complimentary cardamom popadoms with alternative dips, and a chefs special amuse bouche. 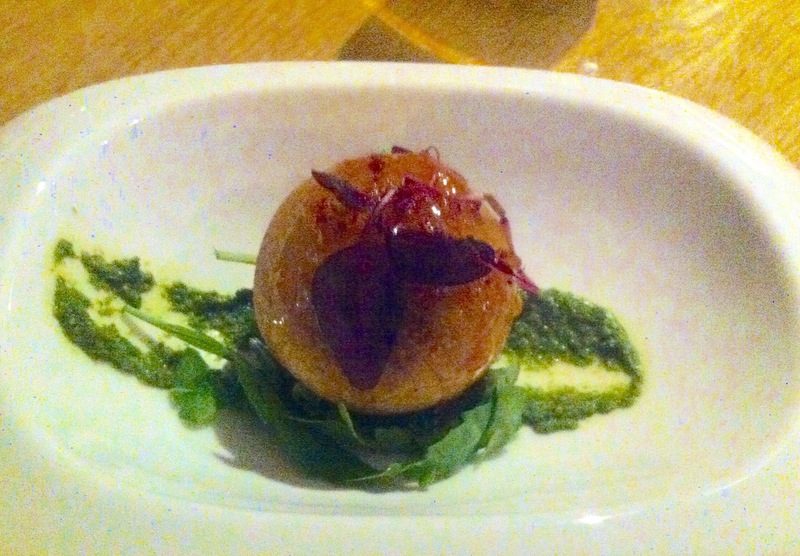 The first course was Kopra Pethis (Gujarat, North West India) a delicate potato ball with coconut and spices. It left you with a nicely heated pallet afterwards but not too overpowering. Next was Chaat Pati (Mumbai), which was a trio of cold street food including: Cold tea in a shot glass poured into the ‘crisp disc’ resting on top, a second crisp disc filled with an assortment of diced vegetables and Bhel Puri, one of my favourite dishes at Bundobust. Bhel Puri is traditionally a mix of puffed rice, peanuts, potatoes, tomatoes, tamarind & coriander chutney, topped with Sev (small pieces of fried noodles). It’s a deliciously tangy dish with varying textures. Masala Dosi was brought to our table next. 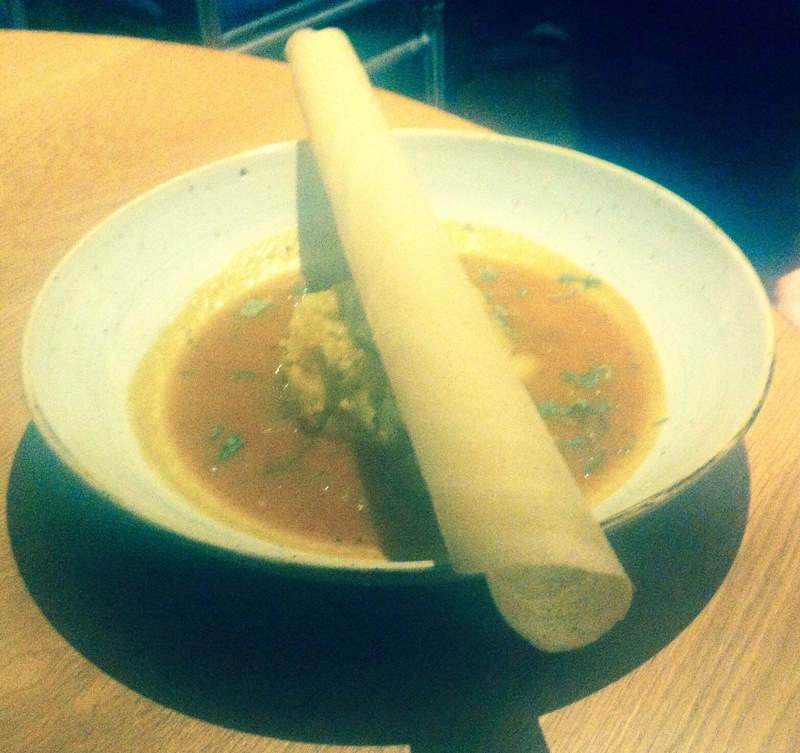 A potato and onion curry with a lentil broth served with a crepe. This dish hails from Kerala in Southern India. The spice combination was delicious and aromatic, giving you a bit of a kick whilst infusing the flavours together well. I’m not going to lie, the four of us were starting to feel satisfyingly full by this stage, but were determined to keep going! Our drink off choice for the evening was Proseco. The light fizzy drink accompanied the dishes well. Alternatively, there is an abundance of craft beers on offer which are matched up with various dishes. The staff are on hand to help you get the right match. The final savoury course was a Paneer & Capsicum curry, from Punjab, Northern India. 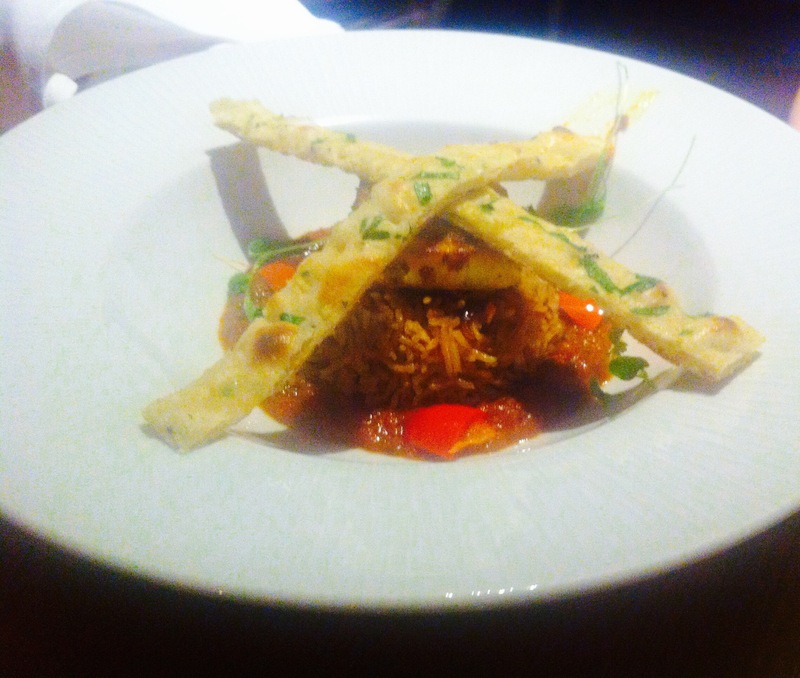 The dish was served with cumin rice & thin strips of Naan bread. I just about managed to finish the dish off. The paneer cheese was nicely cooked and went well with the cumin spice and peppers. The dessert course came out and we were glad it was an ice cream dish, nice and light! 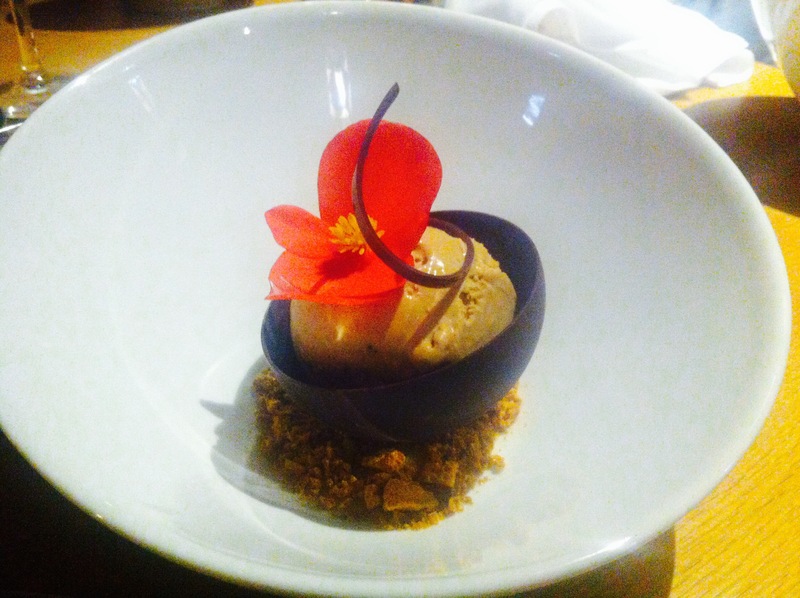 The Choc ni Andhar Chai dish is a masala tea ice cream served in a chocolate shell with honeycomb crumbs. I will definitely recommend Prashads to everyone I meet. Though at £34 per head, the tasting menu is probably more expensive than you’d normally spend on a meal, it’s perfect for something different for a special occasion. Alternatively you could select away from the Tasting menu for cheaper options. As someone who is very much a carnivore at heart, you really don’t notice the lack of meat. Prashads is all about the flavour and spices, using traditional coking methods to bring you real authentic food of India with a modern twist. Kaushy Patel, who started the family ran restaurant with her husband, currently has 2 cookbooks out, one of which I’ve just purchased! Check out their website below for more detail on these books, restaurant address and menu samples. Previous Post Vancouver, British Columbia & Seattle: A long long time ago! The food looks beautiful and sounds so delicious and unusual. The cookbook sounds very interesting!